What’s better than to hide your greens with nature’s antioxidants? Use frozen berries for a cold, crisp flavor without ice cubes in this berry smoothie. Get the recipe for this breakfast smoothie here. Just the colors alone in this refreshing smoothie are enough to inspire you to grab the ingredients and make one of your own. Right. Now. In place of ice cubes, use frozen bananas. The final result will be less watery and it will save you from fruit flies hovering that one ripe banana. For every inch of green, double the inches of pink. No really, we love all of the strawberries in this recipe so much. You’ll be asking where the kale even is in this healthy fruit smoothie. When it comes to kale, you really need strong flavors to mask the density of this leafy green. Pineapple and a 1/4 cup of Greek yogurt is a great solution for said problem. This is a great breakfast smoothie and who doesn’t love pineapple juice? Get the recipe here. Celery in a smoothie? Yes! It might sound strange, but this spinach and celery combination is extra nutritious and hardly noticed behind the flavor of the pears which is great because you’re getting your daily dose of leafy greens. Add a few tablespoons of vanilla yogurt or low-fat milk plain yogurt to thicken it up naturally. Choose a low-sugar option, though! Get the delicious smoothie recipe here. 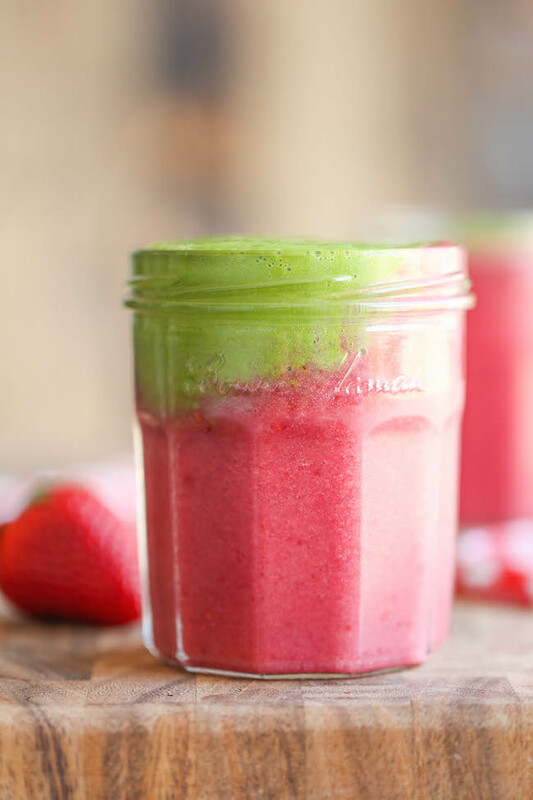 This smoothie is perfect for a little daily detox to cleanse out your liver. Plus, you get more than your meals serving of veggies in an instant. What’s not to love? Add a dash of orange juice (or even orange juice concentrate) to get a nice citrus flavor and some extra vitamin C. A dash of apple juice is a great way to amp up the apple flavor, just make sure you choose a low-sugar option. Do you see the color of these bad boys? That’s exactly why you should make them. Oh, and because this tasty treat is completely delicious. Who said healthy food had to be boring? This smoothie is a great high fiber option. If you’ve never had a smoothie with the tartness of added cherries, here’s your chance. The tartness is good for your stomachand the juice helps completely hide the existence of green goodness within. This is better than ice cream! Add a sprig of fresh mint for a nice kick. Get the recipe here. The picture alone shows you this is a sneak attack of smoothie proportions, once again. Apples, berries and peanut butter work together and amongst their close friends to hide the spinach in this smoothie. When in doubt, add chia seeds. This is a great source of your regular vegetable and fruit servings. Get the recipe for this easy smoothie recipe here. Avocados in a smoothie may seem strange to you, but don’t kick it if you haven’t tried it! The healthy fats it provides work wonders in this refreshing treat. The combination of it with the blueberries also helps to mask the taste if you’re not a huge fan of either avocados or spinach. Use Greek yogurt as a thickener if you want to eat this with a spoon, and some vanilla protein powder will make it even more filling to last you all morning. This smoothie gets its sweetness from the dates that are included inside, as well as an extra splash of cranberry juice and the addition of a banana. Sign us up for this easy energy boost and immune system strengthener! Get the recipe for this fruit smoothie here. The idea of putting whole apples into your smoothie might not seem logical at first, but when you can have a smoothie that tastes like apple pie and it’s good for you . . . how could you say no? This is the perfect quick breakfast for the busy bees out there. If you’re vegan, this is the perfect smoothie for you. In place of regular milk, this recipe calls for soy milk, which you can also trade out for any other nut milk that you prefer. Added plus? This recipe is lower in sugar than most smoothie recipes. The mixed berries in this smoothie are a great way to use up what’s left in the crisper drawer. Nut butters are great for adding thickness and a bit of texture to smoothies. That and the existence of a frozen banana make this smoothie thick and creamy just like you like it. It sounds crazy, but a dash of coffee and a tiny tip of vanilla extract will give it an undetectable boost.